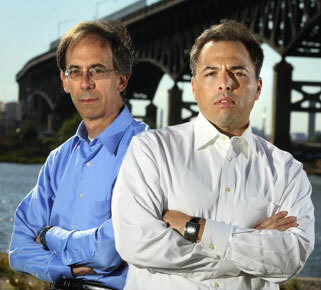 Ted Sherman, left, and Josh Margolin, authors of The Jersey Sting. It was one of the most sordid chapters in the long history of political corruption in New Jersey, and it came to light on July 23, 2009, with the arrests of 44 people. Five of them were rabbis in the Orthodox communities in Deal and parts of Brooklyn. Among the others were three mayors, dozens of public officials, and an Orthodox Jewish real estate dealer accused of brokering the sale of a human kidney. The man whose massive wrongdoing made all the arrests possible is Solomon Dwek, the son of a respected rabbi from Deal’s Syrian community and the self-confessed operator of a $15 million bank fraud and Ponzi scheme. Watching the events closely were two reporters from The Star-Ledger, Ted Sherman and Josh Margolin. Their voluminously detailed 386-page book, The Jersey Sting, was published in March by St. Martin’s Press. “It was surprising to me because when I go into my rabbi’s office there is no money-counting machine,” said Sherman, a Conservative Jew who also took part in the interview. What especially upset Margolin was what he heard on surveillance tapes Dwek made after agreeing to cooperate with federal prosecutors by targeting suspects in bribery and money-laundering schemes across the state. At one point, suspects refer to money as “gemaras,” an ironic reference to the Gemara, a major component of the Talmud. Much of the book details the activities of Dwek, a rabbinical school dropout who lured investors in and outside his tight community into a Ponzi scam. And what of the Orthodox men with apparently deep religious values whom he allegedly lured into lawbreaking? According to Margolin, “The federal government believed, and Dwek believed” it was not uncommon to encounter money-laundering at yeshivas and charities in some Orthodox communities. In February, Dwek’s former partner, Joseph Kohen of Long Branch, was sentenced to two-and-a-half years in prison and ordered to pay $22.79 million in restitution for his role in the bank fraud that propped up Dwek’s real estate empire. 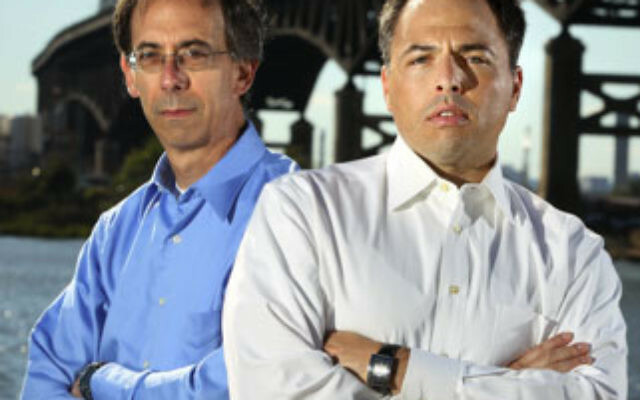 Until Margolin departed The Star-Ledger for a reporter’s job at the New York Post last December, he and Sherman worked together for 10 years. They spent “a lot of nights and weekends” during the past seven months writing The Jersey Sting. They have never been able to interview Dwek, who is being held incommunicado by FBI agents as he is being prepared to be a state’s witness in upcoming trials of political figures and two of the indicted rabbis, Edmond Nahum of Deal and Lavel Schwartz of Brooklyn. But they were able to break through walls of silence that normally surround the intensely insular Orthodox worlds in Brooklyn and Deal. “We did it fact by fact, quote by quote, to get any access to the Syrian community or the hasidic community,” said Margolin. “People told us it was going to be impossible, but we did talk to people,” added Sherman. The two reporters are discussing collaboration on a second book. And sometimes they joke about The Jersey Sting going Hollywood. “We talk about this all the time and the movie rights are still up for grabs,” said Sherman.